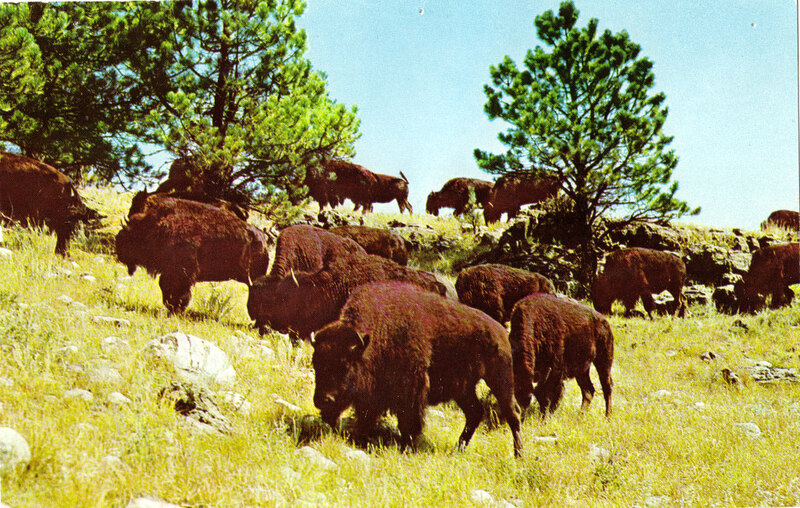 Postcard US-3761486 to Germany is a vintage card showing Custer State Park, a state park and wildlife reserve in the Black Hills of southwestern South Dakota. On the back of the card, it reads: "Custer State Park is one of the largest State Parks in the U.S.A. It contains 128,000 acres of wonderful scenery, consisting of mountains, picturesque gorges, beautiful lakes and streams. 90,000 acres are under fence, and roaming unmolested within this enclosure are Buffalo, Elk, Deer, Big Horn Sheep, Rocky Mt. Goats and Antelope." Wikipedia lists the park area as 71,000 acres. Founded in 1912 and named after Lt. Colonel George Armstrong Custer, the park has an annual buffalo roundup and auction in September, where buffaloes are rounded up, with surplus sold at auction so that the remaining number of animals can be sustained by the rangeland forage. However, those "buffaloes" are actually American Bison as shown on the card.